Art and Tech Part 3: Can We Know the Dancer from the Dance…? The 20th century offered artists – and everyone else – the greatest number of technological advances in human history. But these advances also changed human ecology – and artists and art – in startling ways…. The turn of the 20th century saw humanity in the midst of an onslaught of technological change that has permanently altered how we communicate, travel, and entertain ourselves. The telephone made it possible to hear the voices of friends and family over remarkable distances and receive news, especially personal news, faster than ever before. The automobile and airplane made visiting those distant loved ones first possible, then feasible, ultimately expected. And the phonograph, motion picture camera/projector and later radio and television (remember, television’s blockbuster effect on home entertainment was delayed at least a decade by World War II) made home entertainment as simple as passively sitting and listening/watching. The culture became both easily mobile and easily sedentary in one fell swoop. Modern photography, already 75 years old by the beginning of the 20th century, had been appropriated for artistic purposes for at least 50 years. However, its documentary function far overshadowed its power as an art form for many decades. The newer technological innovations of recording and film offered artists opportunities – but unlike other technological innovations such as I mentioned in the previous essay (industrially produced paint for artists, the use of the typewriter by authors, the harpsichord’s replacement by the piano in music), these technological innovations did not necessarily lend themselves to exploitation by artists. In truth, the technological changes that developed in the 20th century changed not simply how art was made but how art was conceived and executed and how art came to be viewed in ways that we have not fully considered. A look at the changes that occurred and what their possible meanings are for us culturally seems apropos. The 20th century’s explosion of technological development almost immediately led to arguments among artists, writers, and musicians about how art might be defined. The move away from pure pictorial representation, already well underway thanks to the work of the Impressionists who were, it could be argued, reacting as much to the invention of photography as to what they saw as the limitations of realism, expanded and extended into movements progressing from Expressionism to Fauvism to Cubism to Surrealism to what some scholars might call “the last gasp of art,” Abstract Expressionism. Given that photography, whether still or motion, could capture the human (really any) image more accurately than any artist, artists asked themselves a simple (if profound) question: what can one depict if not the form? Their answer, in one way or another, was often the emotion or the thought. Art became less about representation of people and events and more about depicting in painting or sculpture what the artist (and by extension the viewer) thought and felt about the people and events. This is complex stuff, to be sure, and paralleling as it does the rise of a new medical “technology” (to use that word in a broader sense than merely in reference to machinery), psychology, which purported to be able to analyze and “fix” (i.e., heal or cure) mind/emotional illnesses, such art requires that general viewers have more knowledge and approach art works with a more sophisticated mindset than previously required. 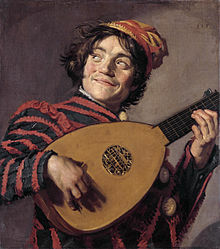 Franz Hals’ painting of a lute player is one sort of viewer experience. The most cursory viewing can offer one some comprehension of the work. Further discussion will depend on the viewer’s interest, knowledge of artistic technique, or other motivations to investigate the work in more depth. But even a small child could describe what Hals has done in this work. This is art that can be “appreciated,” to use the old schoolhouse term, by novice or expert. Pablo Picasso’s painting of a similar subject is a very different viewer experience. One needs considerable explanation from someone knowledgeable about art history and artistic technique to begin to explore the work and derive some sort of comprehension of what the artist is aiming at. This is art that challenges any viewer – and baffles many, if not most. 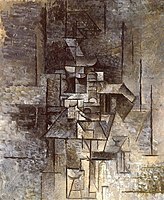 This is the idea of a mandolin player as Picasso experiences it rather than a “picture” of a mandolin player. The artist’s hope here is to capture an aspect of seeing the musician that photography cannot. Similar reactions to technology occurred in music (dodecaphony) and literature (stream of consciousness). Their direct connection to, say recording music or the telling of stories via film may seem more tenuous, but it makes sense to consider that in the case of these other art forms the artists were trying to capture something that they believed the new technologies were unable to do. Finally, there is the artist’s critique of technology’s effects on artists – and the ramifications of those effects upon conceptions of art. What leaps to mind, of course, is the work begun by Marcel Duchamp (which he called “anti-art”) and continued by dadaists. 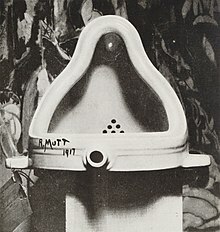 These artists exploited pieces of technology simply by proclaiming them art (see Duchamp’s famous “Fountain” – a urinal signed by the artist – at right) and argued that creating art might be a much less structured, rule-bound activity (perhaps they saw the practice of art as a “system” and hence, a technology to be exploited or resisted) than the culture had defined. Thus 20th Century Modernism can be seen art’s reaction to the rise of technologies. What artists may not have considered thoroughly was how their new aesthetic might be received. These new technologies changed audiences just as they changed artists and art. The new technologies of communication and travel were aimed, not at artists, of course, but at the much larger public. One could drive to a museum or art gallery, to a concert hall, to a book store or library to have new cultural experiences. But one could also drive to a nickelodeon or movie theater, to a dance hall, to a magazine/comic book stand for entertaining experiences. And, as one of my friends who takes a hard economic line on – well, all human endeavor – might put it, the audience was voting with its pocketbooks for the “art” it preferred. The argument over what art people ought to be interested in versus the “art” they were interested in was perhaps one of the great arguments of the 20th century. And it is a two- pronged argument, so it makes sense to look at both of its aspects. The first is the classic “high” vs. “low” art dichotomy. Whether one went to the ballet or the burlesque, to “legitimate” theater or to vaudeville (supplanted by movies as the century moved along) was a cultural identifier – it enforced ideas of class in what was supposed to be a classless society. The mediator of this dichotomy was school – which taught students about “high” art and generally ignored “low” art except to excoriate it for its “corrupting” effects on youth. This dichotomy thus involves another “technology” – universal public education – in its power struggle. In case you’re wondering, “high” art lost. Its identification with school, once a benefit, eventually became a liability. “High” art was “school” art – forced on the young. “Low” art had the support of the rest of the world. It was everywhere but school, coming from radios, record players, and movie screens. This points to the second prong of that argument I mentioned above. “Low” art – pop music in one form or another, distributed widely thanks to recording technology and radio, and motion pictures, which became narrative driven very quickly after their invention, became wildly popular with the record buying/movie ticket purchasing public. Simply said, “low” art used technology much more successfully (for multiple reasons) to attract audiences. 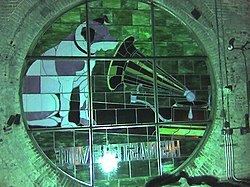 Radio and later television reinforced the power of technology to appeal to and influence the public. Radio programs from the 1920’s through the 1960’s offered versions of popular movies and also played music for large portions of the broadcast day, that . Television’s role in validating pop music and films as “the art of the people” was even more powerful. It simply became a struggle between levels of exposure. The majority of people who grew up in the 20th century were exposed to “high” art in limited quantities, “low” art in vast quantities. Add to that the challenging nature of the high art produced during the century and it is not difficult to see why the public would feel more comfortable with a work such as Gone With the Wind in either its literary or cinematic forms. “High” art’s response to this was ultimately chaotic. Abstract expressionism was replaced by pop art which took as its subject matter advertising, comic strips, and celebrity. Post modern literature spent much of its time and energy mocking itself and its readers. And modern “serious” music offered readers – silence. But for all this effort at becoming provocative as a way to become “popular,” “high” art continued to lose audience and become ever more marginalized. In the next and final installment in this series we will look at the end of the 20th century and the arrival of the “ultimate technology” for connecting artist and audience, the Internet, and whether its oft extolled promise as an avenue for art has been a boon or bane for art of every kind. 3 Responses to Art and Tech Part 3: Can We Know the Dancer from the Dance…? The third part of this four-part series on Art and Technology.